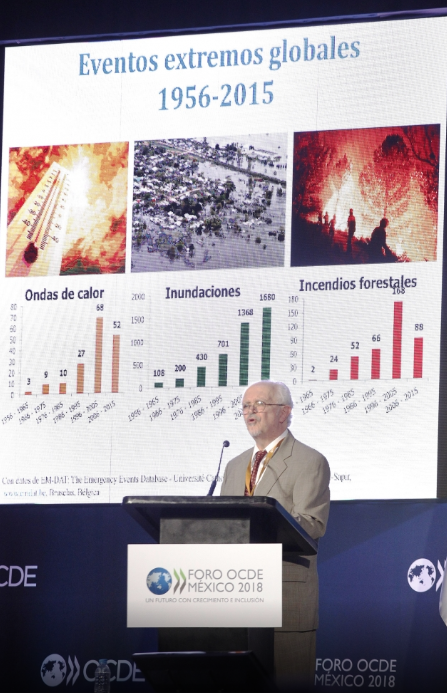 The OECD Mexico Forum 2018: “A Future with Growth and Inclusion” was held on March 12 and 13 with the participation of Dr. Mario Molina. 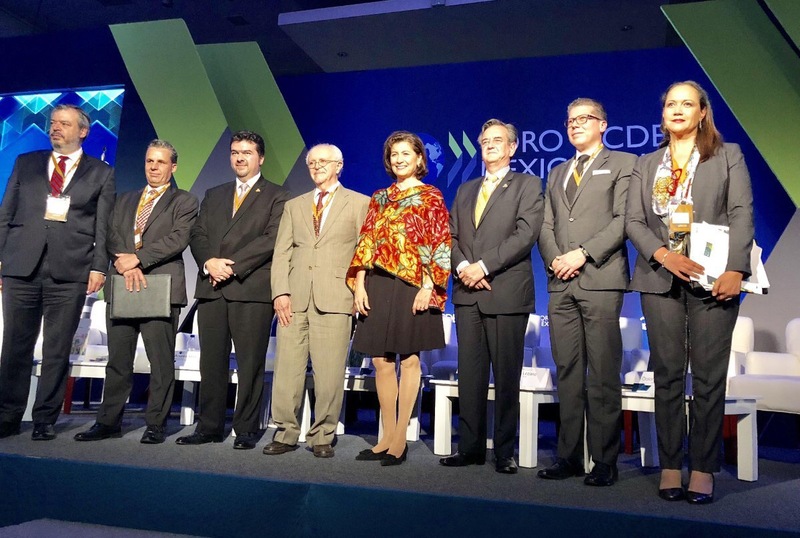 The OECD organized this Forum in order to discuss the most recent socio-economic and environmental challenges in Mexico, for which its most recent publication was put to discussion: “Getting it Right: strategic priorities for Mexico”. Dr. Molina began his presentation “Science and Politics of Climate Change”, mentioning several environmental problems that Mexico must solve: 1) subsidies to fossil fuels, to achieve a transition towards a low carbon economy; 2) the application of a carbon tax, and 3) to take into account that although natural gas is considered “clean energy”, it is only a transition fuel that will have to be overcome by the generation of renewable energies in the long run if international mitigation commitments must be met. The science of climate change is not well established. Talking about climate change is for future generations. Fossil fuels are crucial for our growth. “It’s a wrong belief. There have been very clear surveys that show that more than 97% of experts fully agree that the climate is changing and most likely because of humankind”, said Dr. Molina. In giving a summary of the science of climate change, Dr. Molina explained that this is a problem of global emissions, so it has to be solved and worked together as demonstrated by the creation of the Montreal Protocol to forbid the production of chemicals detrimental to the ozone layer. He explained the complexity of climate evolution and its relationship with greenhouse gases to understand the evolutionary process of the natural climate, and that which was caused by humanity since the industrial revolution, due to an increase in carbon dioxide emissions, amongst others, never seen before in a significantly short period of time. To correct the myth, Dr. Molina mentioned that the Intergovernmental Panel on Climate Change (IPCC), a group of scientists who voluntarily and independently review the conclusions on academic studies on climate change, reached consensus in their last report of the probability of more than 95% that this phenomenon is of anthropogenic origin. Dr. Molina described how it is possible now, for the first time in the history of the planet, to navigate the North Pole and bring tourism because the ice is melting continuously. This is one of the most serious consequences of climate change that are happening in the present and cannot be ignored. Therefore, he said, it is false to think that this is a problem that future generations must solve if it already affects us today. He also explained that it is complex to declare that climate change is the direct cause of extreme events such as floods and hurricanes. What is certain, he stressed, is that climate change definitely exacerbates the negative effects of these phenomena as well as their frequency and intensity. He added that not to attend and prepare for these consequences today with clear strategies would only increase its cost in the future: “There were many hurricanes this past year such as in the Caribbean and it has cost a lot of resources, as well as forest fires suffered in the State of California”, he said. “For years we knew that it was less expensive to reduce emissions of fossil fuels than to switch to renewable energy. But in recent years, solar and wind energy have become competitive”, said Dr. Molina. “Of course, they are intermittent but there are advances in how to store and transmit the energy. Technology is advancing and there is no excuse: it is not expensive anymore and what we have to do is plan and with enough anticipation”. After explaining the science of climate change in the first part of his presentation, Dr. Molina went on to explain the politics of climate change. He recalled the international process of climate change negotiations that have taken place at the Conferences of the Parties of the United Nations Framework Convention on Climate Change (UNFCCC). He spoke about the importance of the COP16 that took place in Mexico in 2010 and the mechanisms developed by member countries to reach the historic Paris Agreement during COP21 in 2015. “What was achieved in Paris was that all countries signed and everyone agreed to work together”, he emphasized. However, the Agreement itself is a weak mechanism. The objective is to avoid the global average temperature to increase beyond two degrees Celsius by the end of this century. However, Dr. Molina confessed this is not enough and efforts must be multiplied to reduce the impacts of climate change. He also referred to the domestic policy of the United States, since President Trump recently announced that it would pull out of the Paris Agreement, putting into play the process of international negotiations. He said that fortunately, mayors of different states of the US have decided to follow the path of the Paris Agreement and have made significant progress to mitigate their emissions, as is the case of the State of California. “Science does not tell us what to do but it is in politics where economic and social issues are addressed, but above all, it is a question of ethics. It would be a gigantic lack of responsibility not to act “, said Dr. Molina. Finally, he admitted that Mexico is operating as a leader among developing countries to align commitments so that we act together: “We are very vulnerable in Mexico and it will be very bad if we do not solve it”. During the presentation of Dr. Molina, the following personalities attended: Gabriela Ramos, OECD Director and Sherpa before the G20; Andrés Albo Márquez, Chairman of the Commission for Private Sector Studies for Sustainable Development CESPEDES; Jorg Paasche, Director of Government Banking, HSBC México; Luis Lozano Olivares, Legal and Institutional Relations Director, Toyota; Dolores Barrientos, Representative of the UN Environment Mexico; Rodolfo Lacy Tamayo, Undersecretary of Planning and Environmental Policy of the Ministry of Environment and Natural Resources (SEMARNAT); and Leonardo Beltrán Rodríguez, Undersecretary of Planning and Energy Transition, Ministry of Energy (SENER). Col. Bosques de las Lomas, Cuajimalpa, C.P. 05120, Mexico, D.F.